For a central Floridian like me, when the temperatures dip below 50, it’s chilly outside! However, even for a central Floridian, it is a little bit hot out for the end of October (temperatures were in the 80’s today)! 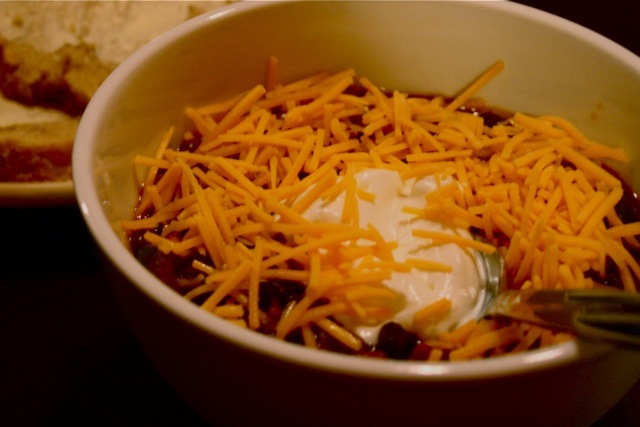 Last winter when it got chilly, Artie whipped up a batch of what I termed Slow Cooker Veggie Chili (which was actually vegan chili until I topped it with sour cream and a sprinkle of cheese). He made up the recipe as he went along, so feel free to adjust to your tastes. This meal is best served with crusty bread (for dipping) and a tasty brew (like a Harvest Moon). I’m hoping that by posting this recipe, I can coax some cooler fall temperatures to north Florida this week. Enjoy! Layer the onion, sweet potato, and zucchini in the bottom of a 5-quart slow cooker. Top with Boca crumbles, canned tomatoes, beans, diced chilies, and spices. Cook on low for 8 hours. Serve topped with sour cream, cheddar cheese, or cilantro.